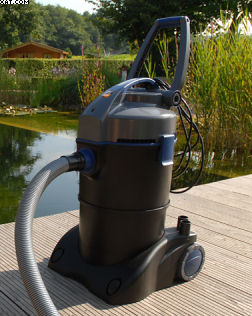 OASE reinvented the pond vacuum (again). Now you can not only clean your pond easily but also maintain your pool or swim pond – all in comfort from the edge of the water with the included accessories. Pondovac is the premier pond, pool and household wet vacuum on the market and it is now even better: A new, more rugged design, aluminum suction and more suction power tubes make Pondovac 4 the only pond vaccuum you ever need to own. Dimensions (Diameter x height) 15" x 27"